The A-HD performs 720P high definition video quality to provide a whole new high quality DV experience. One-touch recording allows you to capture stunning HD (1280 x 720 - 16:9 aspect ratio) video clips at 30 frames per second with advanced H.264 technology. Connect the camera to your TV/VCR/DVD player to record video clips, pictures, and audio recordings, and playback directly on the built-in 2.4" color LCD. Record Video from DVD's, TV, VHS, or from Any Device that has RCA outputs for entertainment on the go! Equipped with 5 mega pixel CMOS sensor, the still image resolution of the A-HD is enhanced to 8 mega pixels. Auto-Focus helps you get the best pictures every time! 2x real time digital zoom allows you to Zoom In/Out while recording video! Review and playback you HD video clips and hi-res pictures in real time. LCD swivels 270 for unlimited video and photo taking. Enhance image quality while capturing photos in darker environments with your A-HD. Conveniently charge your new A-HD via the USB cable when connected to your PC or use the AC Charger cable included. No need to remove battery from camera. Connect your A-HD to your HDTV Component input ports to display your high definition video clips and still pictures, sharing them with friends and family. The A-HD allows you to use up to 8GB of SD card storage to record longer video before having to upload to your PC. I needed a knock-around HD camera. Something that would fit in a briefcase, while taking video clips better than SD (standard definition) quality. So, I thought I'd take a chance and order an unknown-brand (AIPTEK), but had decent reviews here on Amazon. * Nice, sharp HD quality video at 720. Not 1080, but who cares! The color is quite decent, and the sharpness for a little camera is terrific. While it can't match a 3 CCD HD, or a larger CMOS chip camera shooting at 1080 it does the job in a compact form factor. I do expect to take this camera with me everywhere. There was a comment here about the plastic housing...it's not that bad. I wouldn't lend it to kids, or drop it on concrete, but it's sturdy enough to survive in a briefcase, or purse if it had a small little protective hard case. Note: Purses and soft briefcase tend to be especially dusty - not a great place to stick electronics IMO. * The audio is decent. I was shooting some scenes in the car with an open window and it surprisingly filtered out most of the road noise and caught the dialog inside! The mic. is placed on top of the camera. This can cause some noise if you move your hands about the camera while shooting. However, as with any camera there is some accommodation given the ergonomics. On saying that I do wish the record on/off button was larger, and the joystick controlled a tad bigger. Folks with ham-sized fist (like me) might have to fumble around a tad more than say someone with dexterous fingers. Low light conditions came out a tad grainy. But then again, you can't expect the little camera to do everything. One of my new CMOS camera is equally as grainy as the AIPTEK in dark-lit conditions. There is a night-mode selection in the camera, but I have yet to try it out. * Transfer to Macintosh. All I had to do was hook up the USB cable and the Aiptek was recognized as an external hard drive. I simply transferred all the files into my mac and now they're ready to be edited as .mov files. So, it's a breeze to edit in imovie, as well a Final Cut. Very, very simple. * Longevity - I don't know. I've had this camera now for three days. If it breaks, I'll just get another one! Useful, easy to use, inexpensive digi camcorder! The good: Inexpensive, easy to use, quick to start recording, easy to export (onto a MAC), removeable media (SD card), has a zoom, can take pictures, is light, has a flip screen for self-recording. The bad: Short battery life, no image stabilizer (hope you have a steady hand), and the H.264 compression is not easy to use. (To use in FCP, I downloaded MPEG Streamclip and converted to Apple Intermediate Codec, which sadly made the clip files 10x larger!). Zoom function is jumpy and microphone is so-so quality. Really great value, don't be afraid to buy. Decent, inexpensive, but will not work in cold / icy weather. I bought this as an inexpensive and simple camcorder for the ski slopes. I felt nervous about using an expensive device. The following are my ramblings that I can think of real quick. If it worked in cold weather, I would have given it 3.5-4 stars because on how inexpensive it is. The cold weather affects it, and would not power on for most of my efforts. I stuck it closer in one of the inner pockets of my ski jacket, but the best I ever got was a 10 second clip on sunny days. I thought I had several 20 second clips, but it turned out that it locked up and never saved properly. What a disappointing day it was on the ski slopes. I use it periodically during the summer without any major problems. It has locked up from time to time, but taking the battery out and restarting seems to work. I hate the charger, though. I don't think it is a standard usb device. I tried repeatedly to recharge with my motorola usb charger that I use with my phone, and this device won't take the charge--although, it lights up appearing that it will / does. I would have preferred something more direct to mpeg4 such that I can put it directly to DVD, hddvd, or blueray. However, I guess that is what software and a computer are good for. This unit also does not have an optical zoom--however, for the cost, it is understandable. Aiptek appears to have a unit that costs a little more that has an optical zoom. This product is awesome. I thought I would have to pay a lot of money to be able to capture moments with my kids and family but this product has allowed me to do this without spending over $100 bucks. Yeah, the audio isn't so great, but for the price it can't be beat for the "fun" factor. Where the camera suffers the most (besides not having an optical zoom) is at action shots - I've taken this camera out snowboarding a few times - there's a noticeable "wavy" effect on the video when panning fast or if there are many moving objects. But honestly, not that much of a deal breaker for what it is. Still shots with the camera are really nice. I like this camcorder. Great price, Great value, excellent video quality (when you are in decent lighting). But the audio is just no good. There is no external mic option. I have taken many videos with subjects speaking at normal volume literally 3 feet in front of the camera and the sound is muffled and needs to be turned way up to hear. But the person holding the camera, is heard very well. Its almost as if the mic is pointing in the wrong direction. (Well its pointing straight up, so it definitely is not in the right direction). I like this product conceptually, but being that it is useless for picking up audio ... I'm unsure of how useful it is as an 'everyday' camcorder. And I'm really unhappy that the video format is .MOV - I'm very computer saavy and what others have said is right: there is NO software that edits MOV files on a PC. Just about all of them need to convert the file back up to to a AVI or a MPG (needless to say, that conversion is not simple or quick). This is the note on the company's support FAQ: "Aiptek uses the newer H.264 high-end technology for its HD Camcorders and major software editing companies are working diligently to develop an overall compatibility solution to support this newer technology. We're currently working with a few software editing companies to help speed up the process." I've had the camera for 6 months .... I haven't seen the answer yet. Great Camcorder for YouTube video! 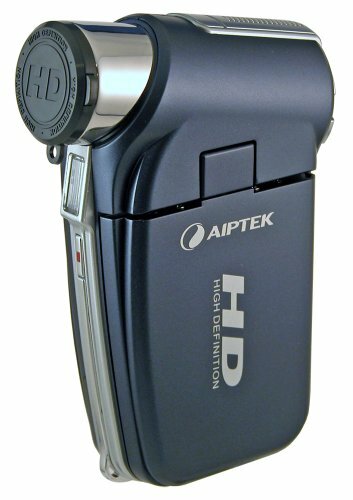 I bought the Aiptek A-HD 720P 5MP CMOS High Definition Camcorder about a month ago, and unfortunately, haven't used it quite as much as I'd envisioned. Still, the few times that I have used it, the open, point, and shoot simplicity, the image quality, and the ease of exporting to my Macbook Pro have certainly been well worth the price. For under $150, this is a fairly impressive little camera. It works pretty well in fairly low light conditions, the audio quality is quite good, and the picture quality, while probably leaving a bit to be desired if the unit cost several hundred more, is quite good, particularly when rendered in native resolution. Manipulating and exporting the resulting video and still image files is straightforward, and the file sizes it produces can be very reasonable once converted for web delivery. With the limited opportunity I've had to use it, I can't really comment on overall battery longevity, but I can relate that after fully charging the unit via the USB interface to my Macbook, it sat around for a couple of weeks before the next use, at which point it performed as advertised, and I probably had it on for well over 45 minutes total shooting and reviewing video items, without the battery indicating it was about to give up the ghost. Looking at the numbers, however, lead me to believe that with a 4GB card in the slot, you'd probably run out of battery before you ran out of storage space for whatever you are shooting. Overall, very light weight and easy to control, with excellent preview via the screen. The only negatives to report are a slight shutter delay from the time you press the button until the camera actually captures a still image - almost a full second or so. Kind of limits the unit for 'action stills' applications. Also, in a 'busy' close up environment, the autofocus has an annoying tendency to base focus on all sorts of things except what you're shooting, but this only occurs at ranges of 3 feet or less. The camera is exactly what I wanted. Its small - takes great video and the audio is not nearly as bad after the update AIPTEK made to it. The low light and sometimes fuzzy audio (on multiple conversations at once) is expected from a $100 camera - but for me I expected it and can live with it without a problem. The only thing on this camera that you need to be forewarned about is there are zero (as far as I have found) paid/free video editing options for this camera. I have done trials on numerous paid video editing software packages and none have worked. Pinnacle Studio 11 says they can handle it, but that is not the case so far for me. It will import the video and the first 2 or 3 frames play and than the video goes away. This has been the case on the last 7 or 8 clips I have tried to edit in the software. Its my understanding (and I have not confirmed yet) that it works just fine on any of the Mac video editing programs (Final Cut Express, etc...) I am purchasing a Mac in the next couple of weeks and will be able to confirm this. Outside of that small hangup for Windows, the camera is great. Decent inexpensive video camera, good value for price. I was a little hesitant to purchase the "cheap $100 video camera" but was surprised how good it works. Its not going to replace those who have top of the line video cameras but for a casual usage, or "quick video usage" it fits in your pocked and is ready to film when opened--a truly video on the go experience. My only regret is not purchasing the higher version for an extra $85+ but you get what you pay for--a good value and instant on video-graphing. I only have two "slams" and they're relatively minor ones. The flash is pretty useless for picture taking, but then again I didn't buy it for a higher end photo taking--that's what I have my Canon for.. It takes far too long for the flash to charge up after each use. The other complaint is that I dropped it (not major drop, but jarred it) and the battery has become loose and I thought the camera was dead. The battery doesn't move when using it so its only after it falls or is jarred greatly.. I assume its a product of it being such a lightweight camera. So I was looking for a cheap and small camcorder to record short films in HD, and possibly post on youtube. I searched around and found this Aiptek model, and found that the main problem people had with it was the sound and indoor shots, but I found a good price online for a open box one and got it. I had the Aiptek MPVR before which I loved, but it also didn't do so well indoors. With that in mind, I got the camcorder and started to test it out. The video quality outside is superb, but is mediocre outside (as expected). The sound, however, was way worse than what I expected, and was very annoying. It was too bad for me to bare it, so I began searching online, and found that there was a mod to attach an external microphone, and replace the internal one. I have never Moded anything before, but decided to give it a shot (because of the cheap price I got it for). If you decide to Mod, I claim no responsibility if your camcorder gets messed up, and it is YOUR sole responsibility. Overall, it's a great buy after the Mod, but before so, I wouldn't recommend it. The sound is too crackly and annoying. I own an expensive Sony HD camera that takes great video and decent sound. But I hardly ever used it. After taking trips to Hong Kong and Costa Rica wit the Sony, and coming back with almost no footage, because the camera was too bulky and expensive to want to carry around, I decided I needed to look into something better suited for my needs. The Aiptek is something I use all the time. I purchased this camera so I could take quick videos of my son, or anything else I wanted to post to YouTube or Vimeo. I did some research by going to Vimeo and searching for Aiptek A-HD. I found some great clips that showed me exactly what the camera can do in HD. Picture quality is very good. It doesn't beat my Sony, but it will beat just about any camera you could have purchased for under $2k 5 years ago. The camera couldn't be much simpler. Flip Video Ultra Series Camcorder, 60-Minutes (White) is obviously the easiest camera to use, but the Aiptek is not going to stump anyone. Fast upload. Unlike the long time my Sony took to bring video in from DV, the Aiptek is super fast at transferring those movies onto my machine. Good use of space. I have a 4 gig card in mine, and it looks like I can get a little over 2 hours at full 720. Cards are so cheap now that I think I should have just got an 8 gig that should cover 4 hours. Small and light. I take this camera everywhere. I hardly ever shot video with my Sony, but this thing I use all the time. All cables included. This was a nice surprise for such a cheap camera, especially in a time of 1 game controller in $400 game system. The box included USB to mini USB, power cord, and even cords to hook up to the TV for normal and HD TV. No HDMI. Sound quality. The microphone is not great, and it's set to the rear. It feels like Aiptek set this up so that the person shooting the video could narrate the shot. But the lack of a external mic jack does limit the use of this camera. Construction. With a low price comes low quality material. When I got my camera in the box, the "camera" button had already fallen off. Not wanting to deal with returning the camera through Amazon, I just superglued the thing back on and it's worked fine since. The camera feels sturdy enough when you hold it, but it does feel a little cheap in the buttons. No stabilization. Since this is a cheap camera it does not come with any built in stabilization, so your shots can come out a little shaky if you're not steady handed. As a digital camera the Aiptek works about as well as most inexpensive point and shoot models. The pictures are acceptable, and the built in flash does a good job exposing details. Like most people will say, this is a great camera for the money. If you're someone who wants to take serious videos and need things like stabilization and external mic jacks, this isn't for you. But if you're someone who would like a good camera to shoot everyday events so you can post them online or save them to disk, this is a camera you should be happy with for a couple of years. It does fit the need for travel as well. It's small enough to throw in my cargo pant pocket, and cheap enough that if lost or damaged, it wouldn't ruin my vacation. I do think it's likely that I'll outgrow this camera as I want to do more video. I'm waiting to see the Sony HDR-TG1 4MP High Definition Handycam Camcorder with 10x Optical Super Steady Shot Zoom (4GB Memory Stick Included), which is about 6 times the price, but looks to be amazing. Maybe a Christmas present for myself. This camera would also be great for teens to start shooting footage beyond their camera phones. I'll likely just hand mine over to my son when I upgrade. When you transfer files to your computer they come in Quicktime, which works great for me since I'm on a Mac. This is perfect for iMovie. I just got this camcorder tonight. I read all the instructions and I think I am going to like this gadget. It feels a little flimsy as it is made of lightweight plastic, but if I carry it in a protective camera case, it should be fine. I like the lens cap. Audio is very quiet, but I will see if I can adjust that better. Guess I have to go on vacation to get some great videos soon. Nice product for the money and I won't be heartbroken or bankrupt if it gets lost or has to be replaced in a couple of years. I have one of these, and use it all the time. I keep it in my laptop bag, and if I ever need to record something, take a still digital picture, or otherwise, it's right there. The microphone is poorly placed at the top of the camera, which can make sound capture difficult sometimes. You just have to remind people to speak up when talking to the camera. This handy little unit creates really nice video for the price. It's compact and easy to charge with either a power adapter or a computer usb port. This is a great little camera for putting in the pocket as a tourist. It takes clear and non-jumpy, full-frame HD videos at broadcast speed. Photos are clear, although the lens is not the best. The 4x digital zoom is as good as any, but at full zoom the image is a little fuzzy. The shutter response time is slow, but if you want action shots use the video instead. Each video scene is stored on an SD chip as a separate movie, in .mov format with H.264 and AAC compression. The camera interfaces with computers via USB with fast and easy downloads using any number of downloading software, at least one of which is built-in to both Mac OSX and Windows. This will not replace my other video cameras with optical zoom and good lenses, nor will it replace my other digital still cameras. Cheap & easy... could it get any better? This is the second model from this manufacture I have bought. I bought the first one before Christmas at a Walgreens for $90 with a $20 mail-in rebate. I found a second battery, from a cell phone supply store, a 110 charger, that is a stand-a-lone, plus one more option; a 12 volt car charger. The battery problem was solved which left me needing to cover the memory questions. I wanted to make sure I had plenty of SD cards and the prices are reasonable for the no-name brands. This all happened preceding a vacation to Cancun. I was ready. All of this set me back less than 150$. I own a very good Canon mini dv that is comparable to the GL-2 that I love to shoot. This little Aiptek does not replace the superior Canon but I will use it 5:1 because of the bulk. The Aiptek fits in a shirt pocket and the batteries last through 3- 2GB SD cards. The quality is what you get for a 100$ dollar camera but that's okay if you know this going in. I do a lot of ATV riding and this will record 10 times better that my helmet cam. The end results are similar to a high end camera phone. All cameras capture is light. This one does fine if the lighting is good, not too much or too little light and you will be pleased with results. I have shot video off my Grizzly 700 with web quality video and then post it on my blog for other like trail riders to view. I liked the camera so much I gave it to my son and bought me a new one. I use an iMac to edit video for publishing and the Aiptek works smoothly with both Final Cut and iMovie. I sometimes open files right off the camera using QuickTime Pro and edit the simple movie with that software. No problems.